James Stokoe makes comics about anything he damn well pleases, and he makes them so well you’re jealous by the end of the first page. For instance, “Wonton Soup” is about cooking. It’s about space cooking, though. Space cooking and space trucking and space ninjas (that hide out in space by painting their suits black with star patterns). It’s presented so simply and so matter-of-fact that it never really seems like anything but a perfectly understandable story told by a friend. Yes, it’s exciting but of course he ran into those friggin space ninjas, they’re a nuisance these days you know? The story focuses on Jonny Boyo, chef extraordinaire and currently low-rent interstellar trucker. How does interstellar trucking work? Just like normal. You know… there are trucks? Anyway at the very start, he and his hedonist trucking buddy land for some gas, and Boyo goes to work with a recipe. Back up though. The first thing you notice about this comic, about any Stokoe work, is that the art is better than you deserve. The first time you see it maybe your eyes track over it and yeah spaceship, dude, airlock… then you look back. It’s so detailed and scribbly and organic and strange. It’s like a rare spice flavoring a dish you’ve had a hundred times and making you take notice again. 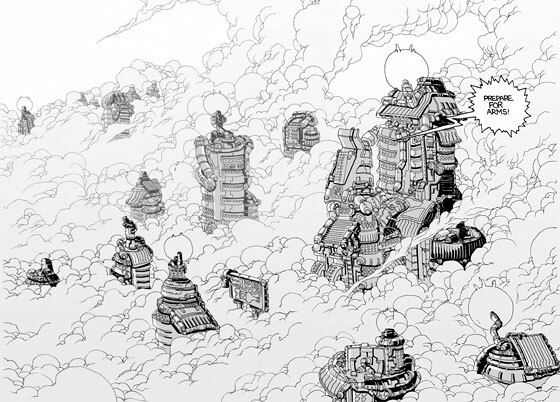 Stokoe is one of the few artists who almost never produce filler. Every panel is something I’d want on my wall, possibly in blacklight poster form. As “Wonton Soup” progresses, we see why a master chef like Boyo isn’t at culinary school any more, and we see some hilariously awesome, lovingly crafted recipe ideas. Stokoe’s recipes are a mix of cooking dreams and nightmares, like the spice that strangles you to death if you put it on improperly prepared food, because it’s a colony of microorganisms whose only goal in life is to be eaten in a delicious meal, second best won’t do. The whole experience is dreamlike, in fact. Occasionally Boyo will break the fourth wall just because, frequently things will happen because it’s expected of the genre, not because anything caused them. Every character introduced gets a sweet as heck design (grey alien with afro? yes please) and almost always at least one sweet scene. The main characters rarely have all that much in common, but they treat each other with all due respect because why not be excellent to each other? It’s an unfailingly optimistic work. Sure, Boyo is great at cooking, but he isn’t the best and he’s still learning. He’s happy to give advice to other would-be chefs that he meets, and he’s convinced that cooking is something anyone can learn if they give it thought and time, no matter what advantage or disadvantage their insane biology gives them. “Orc Stain” is similar in many ways, but differs in a lot of little important ones. The most salient change from Wonton Soup is that things matter. It maintains a sense of humor, but without breaking the fourth wall or being quite as irreverant. The tone becomes a bit more serious even though the world is just as ridiculous. The other major change is that there’s no easy sense of camaraderie between the main character, One-Eye and well, anyone. Orcs, unlike space-truckers and space-chefs, are an incredibly belligerent bunch. 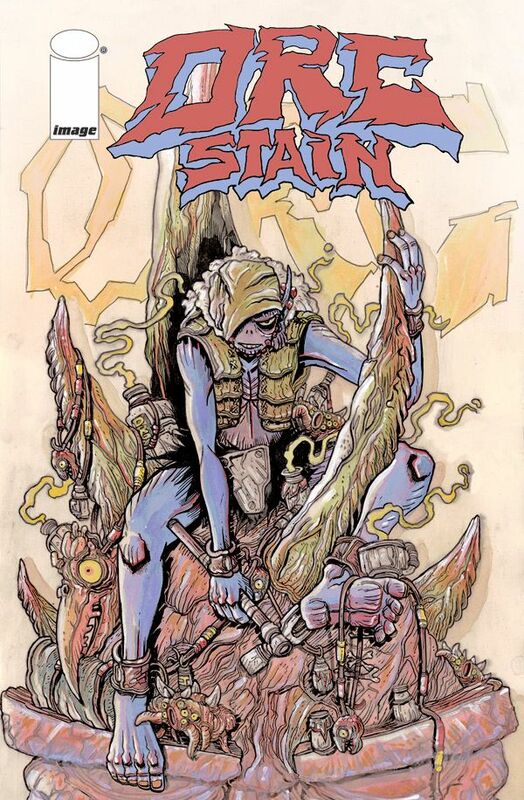 Orc Stain is only 4 issues in, and already it has beautiful full-color Stokoe art, worth the price of admission, betrayal, bear safes, intrigue, and more gronch-lopping than any cultured person will be comfortable with. Go buy Wonton Soup from the Oni Press shop (and check out a 39-page preview!) and grab Orc Stain from your Local Comic Shop, give them a little thrill at their first new customer since 1987. Science is Not Atheistic, Science is Not Theistic.